The opening weekend of TIFF may still be a blur to some festival-goers, but for brands who took part in the second year of the street festival on King St. West it meant the chance to connect with thousands of passersby between Thursday and Sunday. Here’s a rundown of some of the new ways first-timers and returning partners activated their part in the festival. McCafé added another dimension to its sponsorship as the official coffee of the festival at TIFF this year, partnering with Shazam to make its coffee cups interactive. The QSR, with work from OMD on media and Cossette on creative, are using Shazam’s new image recognition option, which takes app users to custom videos when they hover over an invisible watermark. McCafé is using the tech by creating “bean scenes,” plays on classic movies like Braveheart (Beanheart), The Shining (The Grinding) and Donnie Darko (Donnie Darkroast), that have been turned into clips that range from 30 to 60 seconds in length. The cups featuring the clips are available on the free coffee and tea cups being handed out at the McCafé Coffee Sampling Vehicle, which is parked across from the Princess of Wales theatre from Sept. 10 to 20. The Shazam cups were also distributed throughout the GTA over the weekend and will be available at McDonald’s locations in downtown Toronto throughout TIFF. Those who don’t have Shazam are also able to see the clips ahead of screenings at Toronto’s Yonge-Dundas Theatre, or online at Mccafecinema.com. 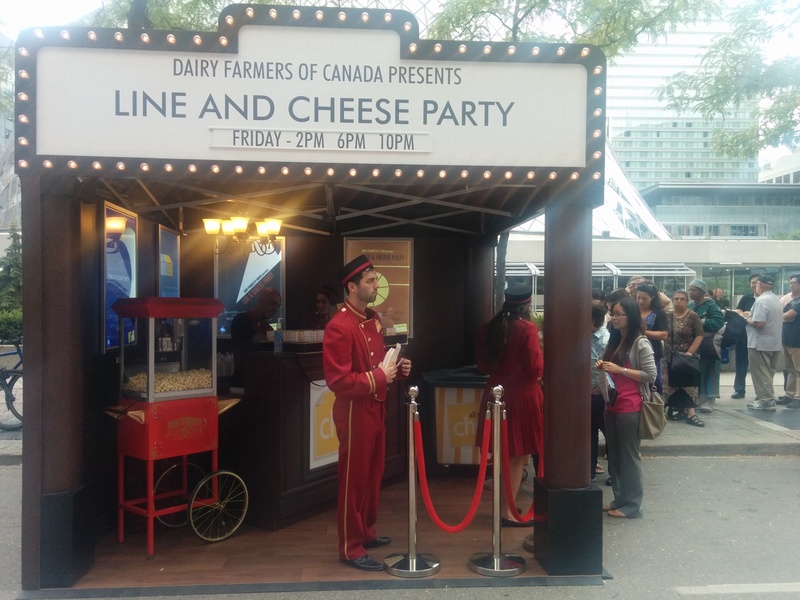 The Dairy Farmers of Canada joined the TIFF street festival for the first time this year, activating with a street-side booth that offered passersby an opportunity to sample Canadian Parmesan popcorn. A few times a day, the organization also hosted “Line and Cheese” parties where street fest-ers could have some Canadian cheese, as well as the opportunity to win TIFF movie tickets by coming up with cheesy takes on classic movies. People could also enter to win tickets on Twitter by tweeting a movie title that had been changed up to be #StarringCheese. The activation was arranged by M2, Launch and Mirium. RBC is currently in the eighth year of a 10-year partnership with TIFF and while it also participated in last year’s inaugural street festival in David Pecaut Square, the bank’s 2015 booth was three times bigger this year. The “Someday Studio” is done up in the bank’s signature blue and yellow colours, and was built around a message to current and potential customers: “Let’s Make your Someday Happen,” promoted through the hashtag #Someday. There is also an RBC commerical that runs before each film. For the week following the festival, the bank has changed its focus from general brand awareness to showcasing its mobile and new payment products, says Jo-Anne Wade, marketing head, Canadian banking at RBC. The marquee event is a great opportunity for the bank to directly engage with consumers as it draws such a broad audience to David Pecaut Square, she says. Over the course of the street fest the bank ran a photo studio inviting all visitors to get their photo clicked and shared on social media. The booth’s Avion Gallery was completely new, and was designed to give card-holding clients and non-clients closer access to stars. “We wanted to give people a better, more memorable experience, and we know the number one draws is access to celebrities,” says Jo-Anne Wade, head marketing, Canadian banking at RBC. With seating for 88, RBC clients and non-clients can win access to the red carpet outside Roy Thomspon Hall for one of 20 screenings (11 more to go). By winning tickets, visitors can reserve a spot in the gallery. The RBC booth will remain on King St. through the week with the photo studio converting into a carnival-style games space. Prizes include anything from popcorn and tickets to the Avion Gallery to TIFF Tickets. Avioners can win tickets to a special VIP screening at the festival as well as entry to win a 2016 TIFF prize pack.